Imagine starting your morning shower with just the press of a button, after which the water comes out at exactly the right temperature. 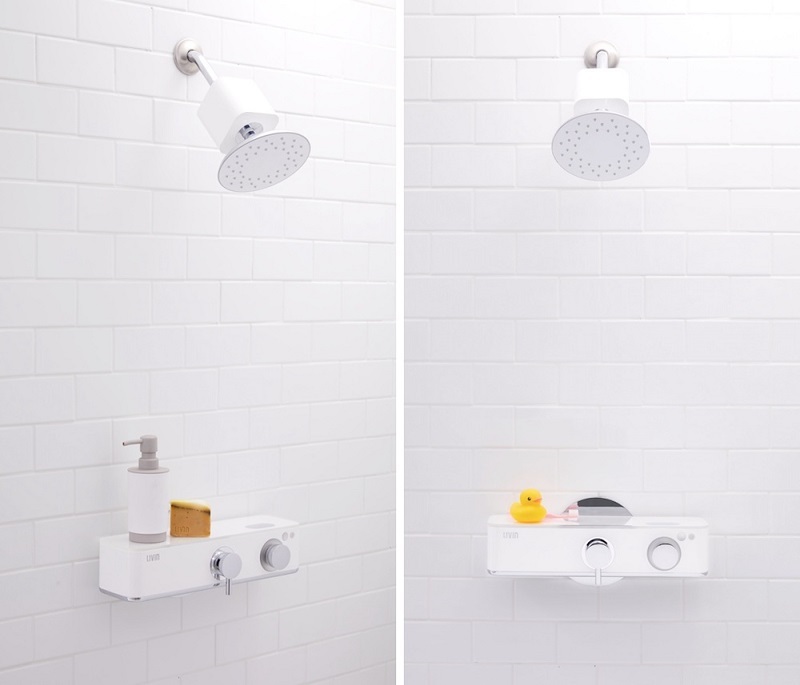 Thanks to a smart new shower system, the anxiety we all experience while waiting for our showers to warm up will no longer a part of our rushed morning routines. Livin was first launched on Kickstarter on January 23rd, 2018. This technologically-advanced shower was created by a small team of designers and engineers in San Fransisco, California. 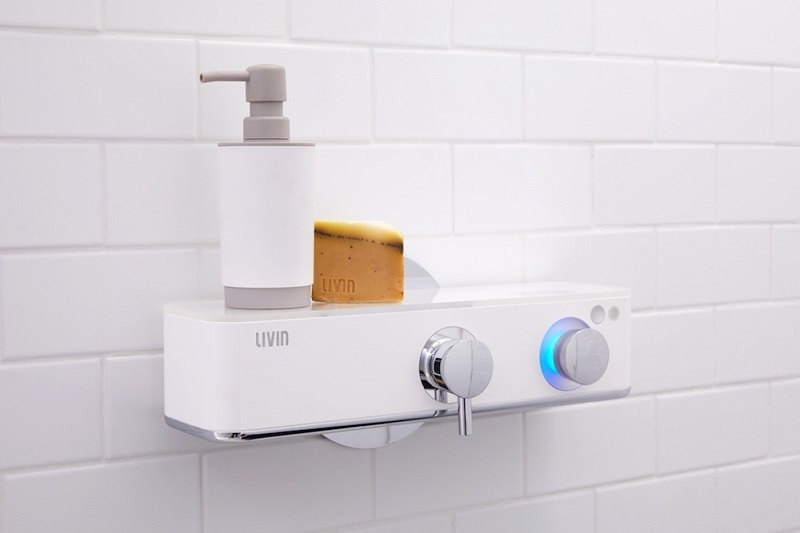 Combining software robotics with modern hardware, Livin provides a holistic shower experience while considering unintuitive temperature controls that would otherwise lead to careless water waste. Turn on your shower with a voice command or from the accompanying mobile app, and it’ll immediately begin warming up the water for you. The Livin then saves water by auto-pausing the shower stream once the ideal temperature has been acheived. At this point, you will receive a notification to remind you that your shower is ready. What’s better than a preset temperature? Being able to pause the water mid-shower! Livin further helps reduce unnecessary water flow by allowing you to pause and resume your shower with a single click. All you really have to do is bathe, cleanse, decompress, and have a great experience. 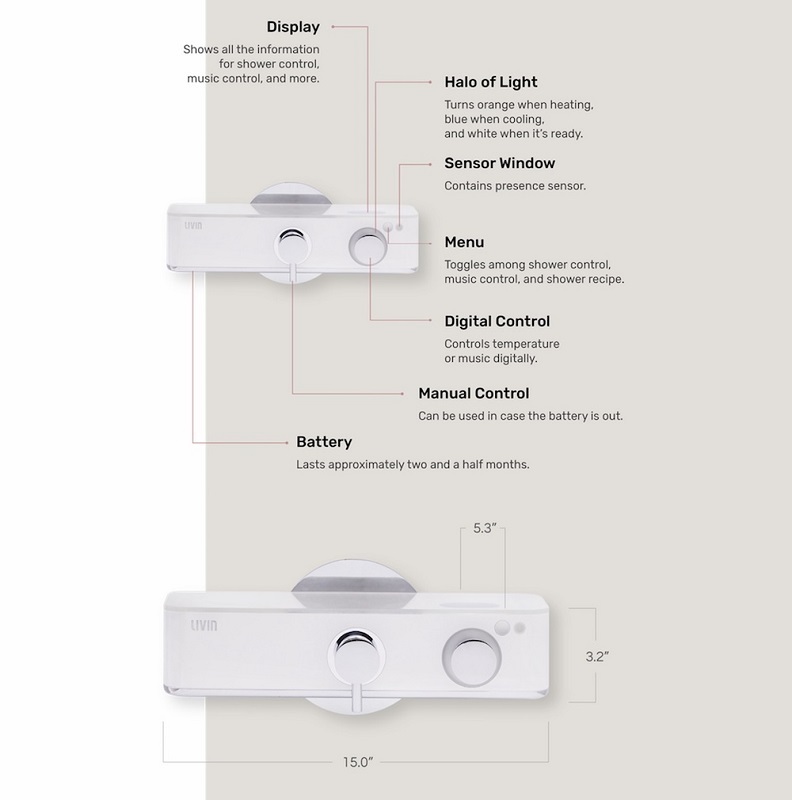 The Livin’s incredible temperature control algorithm works by calculating your shower data in terms of how the temperature is mapped in relation to the opening of the mixer valve. The result is a much faster heating time and about 1,875 gallons of saved water per year for the average household, which is equivalent to some 30,000 glasses of water. Just when we thought it couldn’t get any better, we learned that the valve also uses Bluetooth to sync with your music apps and give you total control of your tunes. Connect to Spotify or Apple Music and scroll through your shower playlist in total relaxation. Use the shower controls to play, pause, and skip songs. 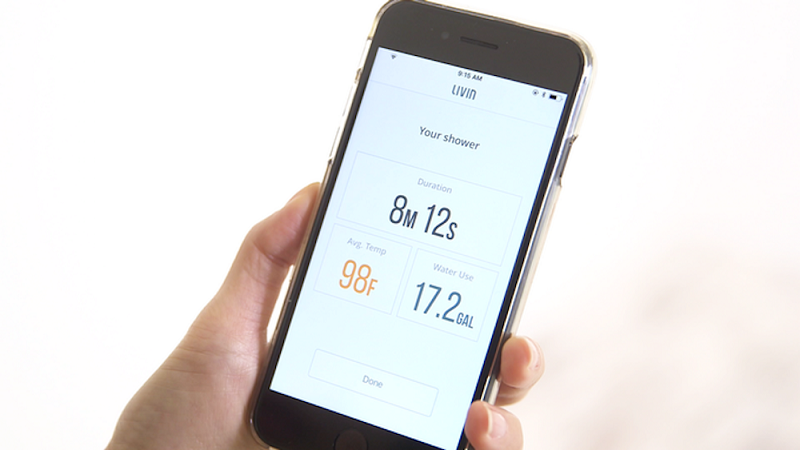 Livin’s developers really went above and beyond for their users by coming up with “shower recipes.” These pre-programmed recipes consist of set temperature patterns that are meant to trigger certain responses in the body. For instance, the “wake-up recipe” graudually cools down the water over the course of your shower to leave you feeling alert and more refreshed. Of course, setting up your shower through Livin’s mobile app isn’t the only way to do things. You can also let your Amazon Echo or Google Home know that you’d like them to prepare your morning shower for you. If you feel like getting extra cozy, you can even let Nest warm the room up for you based on your shower temperature to prevent that awful after-shower chill. Worried that your spouse or sibling will mess up your preset temperature? Don’t be! 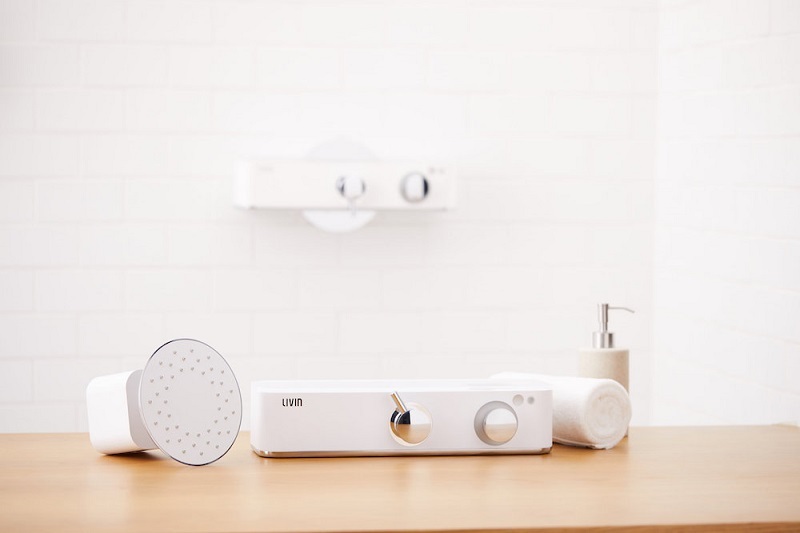 Livin takes into account that everyone has different preferences when it comes to showering, which is why it allows every member of the household to create a personalized setting for themselves. 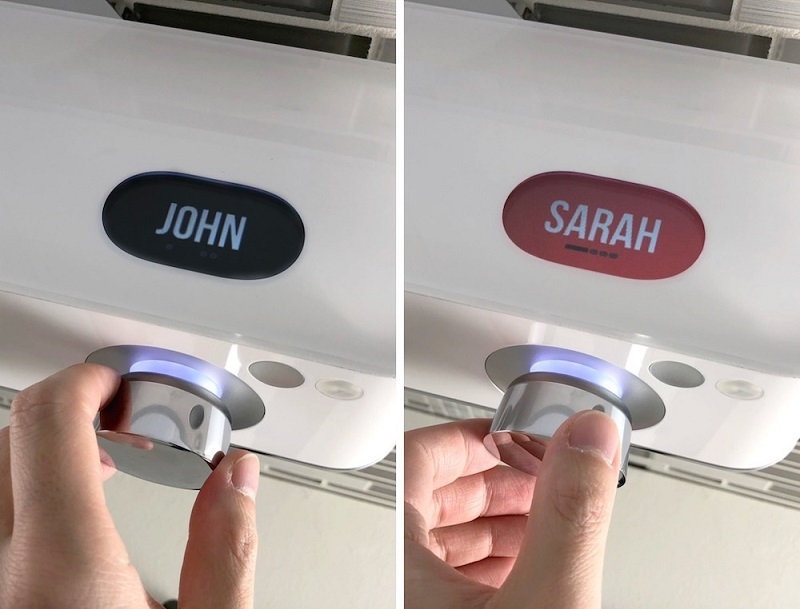 You can create up to ten profiles, each one of which can be programmed to remember a person’s ideal shower temperature, favorite music, and most commonly used Bluetooth devices. Each person will then have access to the tracking of their shower temperature, water usage, and the duration of each shower. If a profile is created for an infant, the Livin will recommend a safe water temperature and put a “safety lock” on it to keep it from getting too hot or too cold. 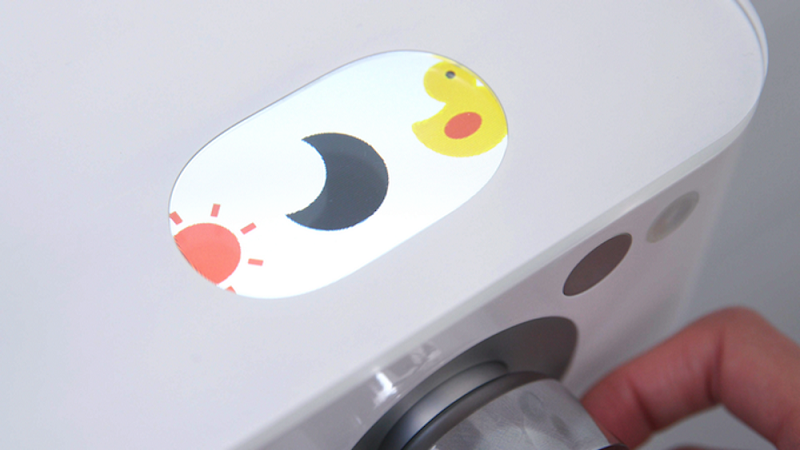 The Livin’s design is definitely a thoughtful one, even when it comes to installation. “You don’t have to tear down walls or call a plumber, just 15 minutes with household tools and you are done,” the team explains. To top it all off, it’s compatible with most of the single-handle valves that are currently the market.